The Optical Disector is stereological probe for counting objects in a thick tissue section. This is an extension to the basic Disector method, which is applied to a thick section using a series, or stack, of Disectors. Rather than using pairs of physical sections (the basic Disector method), optical sectioning is used by creating focal planes with a thin depth-of-field through the section. The Optical Disector begins with a lookup section at the top of the Optical Disector and ends with a reference section at the bottom of the Optical Disector. The focal plane is the current reference section. The lookup section is immediately above the focal plane. A particle in focus at the top of the Optical Disector is therefore seen in the lookup section and not counted. A particle in focus at the bottom of the Optical Disector is in the reference section and therefore not in the lookup section, is counted. Counting frame rules are applied when the particle first comes into focus. 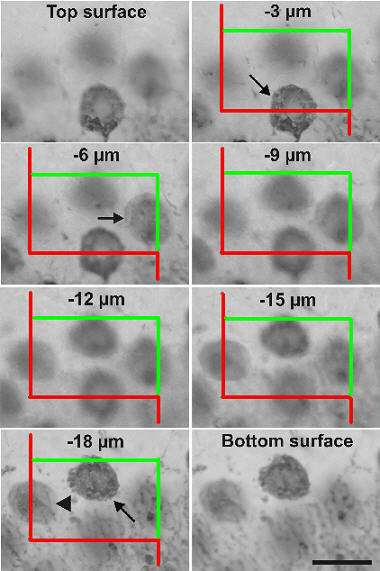 Figure 1 shows a selected microscopic field at the top surface of the section, at six consecutive focal planes below the top surface with a distance of 3 µm between the focal planes, and at the bottom surface of the section that was found 20 µm below the top surface. Between -3 µm and -18 µm, the microscopic field is superimposed by a counting frame. This counting frame served as basis for an Optical Disector with base area of the counting frame and a height of 15 µm in this example. Objects of interest (i.e., cells, nuclei or nucleoli, etc.) are counted provided (i) they are found entirely within an counting frame or hit at least one of the inclusion lines (dashed lines in this example) of a counting frame but not any of the exclusion lines (solid lines in this example) of the same counting frame, and (ii) they come into focus within the Optical Disector for which the corresponding counting frame serves as basis. In the illustrated example, these criteria were applied to the perikarya of the cerebellar Purkinje cells as objects of interest. As shown, a Purkinje cell was found at -3 µm (marked with an arrow). However, the same cell already came into focus at the top surface of the section and, thus, not within the Optical Disector. Furthermore, this cell hit the exclusion line of the counting frame and was therefore not counted. Two other Purkinje cells came into focus at -18 µm, i.e., within the range of the section thickness covered by the height of the Optical Disector. One of them (marked with an arrow) hit one of the inclusion lines of the counting frame and was therefore counted, whereas the other cell (marked with an arrowhead) hit one of the exclusion lines of the counting frame and was therefore not counted. A fourth Purkinje cell came into focus at -6 µm, hit one of the inclusion lines of the counting frame, and was therefore counted. Note that the perikaryon of this cell appeared somewhat blurry, which was most probably due to incomplete penetration of either the primary or the secondary antibody through the section thickness. This is a common problem in immunohistochemistry on thick sections and has been addressed in the stereological literature. In certain combinations of tissue, section thickness, and antibodies, the immunohistochemical reaction might not work in the center of the section but is restricted to the upper and lower parts of the section thickness. This must be evaluated by careful microscopic inspection of the sections prior to stereological analysis, and the height of the Optical Disector and their position within the section thickness must be selected accordingly. Disregarding this problem (i.e., placing Optical Disectors in the center of the section thickness despite improper immunohistochemical detection of the antigen of interest at this place) can cause serious bias in stereological investigations. Scale bar represents 40 µm. West MJ, Slomianka L, Gundersen HJ., 1991 Unbiased stereological estimation of the total number of neurons in the ubdivisions of the rat hippocampus using the optical fractionator. Anat Rec;231:482.